While each of these three definitions simplify a more complex reality, they are nevertheless useful. Each of these three political orientations have certain civic consequences. While honorable people can (and often do) take all three of these positions, the three still can be distinguished from one another. A partisan tends to be interested in victory for their party, at all costs. 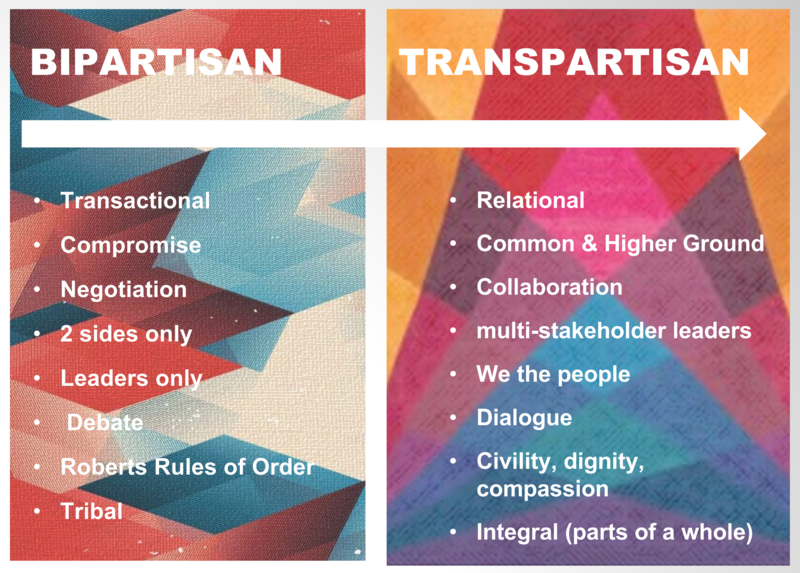 Since partisans equate virtue with their particular party’s position, to them being “partisan” is preferable to being “bipartisan” or “transpartisan.” Since partisan and virtuous are synonymous, loyalty outweighs inquiry. “”Collaboration” or “bridge-building” are considered to be at best distractions, and at worst colluding with evil. And if one’s own party is the sole possessor of truth and virtue, then obviously the end (victory) justifies the means. A bipartisan orientation, as the word suggests, exists in a bipolar rather than unipolar world. It considers the two major parties – who represent the vast majority of one’s fellow citizens as worthy competitors, each of which have strengths and weaknesses. While a person who values bipartisan collaboration may well still be a Democrat or a Republican, they recognize the practical benefit of across-the-aisle agreement. For this reason, they are far more likely than partisans to accept a negotiated compromise because they believe the resulting policy is more likely to endure and be effective. A transpartisan perspective goes beyond both these concepts in that it more highly values interdependence, collaboration, inclusion, civility, respect, and empathy. As evidenced by the 40% of the populace who define themselves to be “independents” and the 53% who do not feel adequately represented by either party, transpartisanship considers bipartisan approaches to be inherently exclusive. Instead, a transpartisan attitude is more likely to focus on effective and innovative solutions – not one- or even two-party mandates. Whether transpartisans call themselves a Democrat or a Republican, a libertarian or an independent, or any other category, they are just as interested in the relationship between the partisan adversaries as they are in a victory for their own party. The two components of “trans-partisan” make clear that each person is a “partisan;” each American has his or her own preferences. At the same time, for the United States of America to flourish, we must also become “trans”-partisans who believe in a pluralistic, democratic civic culture and who are willing and able to work with others to discover our commonalities while respecting our differences. To repeat: all three of these descriptions are simpler than the reality that they describe. But the distinctions are useful because a healthy body politic needs all three perspectives to flourish. Partisan-only politics leads to win-lose seesawing, paralysis or even violence. Bipartisan-only politics leads to a duopoly that excludes all other points of view beside their own. And transpartisan-only politics would be impractical because, as currently practiced, party structures are necessary for organizing and clustering 330 million people’s civic involvement. At the moment, however, these three kinds of civic energy are dangerously out of balance. Partisanship is epidemic; bipartisanship is rare; and transpartisanship is almost invisible. The media accentuate the most partisan voices, neglect bipartisan breakthroughs, and – only recently – have begun to grasp the emergence of transpartisanhip. The transpartisan movement is designed to provide this vital, missing balance. There is a process or relationship aspect to transpartisanship, which focuses on the relationship between political adversaries and enhances their capacity for collaborative problem-solving. This involves providing a safe place for competing voices in our civic and political culture to engage with each other, challenge each other, and inspire each other to form a chorus than can break through the ideological static and bring a new melody into the public square. There is also an emerging content aspect of transpartisanship, which focuses on developing transpartisan positions on difficult issues. This is primarily about overcoming polarization through policy innovations and methodologies that go beyond bipartisan compromise and focus on what works best “” not based on Left or Right theory, but in actual civic practice. Edited by Rep. David Skaggs, Steve McIntosh, John Steiner, Gabriel Dayley, and others.